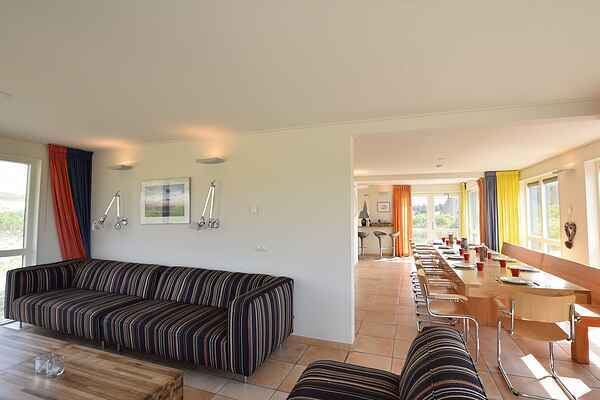 This dune villa is at a unique location on Vlieland, near the woods and directly near a quiet entrance to the beach. You can dive right into the sea in the mornings. The home is situated on steeply sloping grounds, where you can enjoy total privacy. The interior of the holiday villa is comfortable and bright. The U-shaped living room has a cosy seating area and a fireplace. There is a fully equipped kitchen with kitchen island. There are 6 bedrooms with each 2 singles beds. Also there is a small addict with 5 matresses where possibly the children can sleep. For the children, there is the basement with a TV/games room. Additionally, there's a lovely wellness room where you can enjoy the sauna, rainfall shower, steam cabin and sunbed. There is another 'small apartment' with a lovely, spacious bedroom with its own seating and TV and where you also have a private bathroom with bath and shower. The terraces with comfortable sun loungers and large parasols offer a beautiful unimpeded view of Vlieland's woods and lighthouse. This is an excellent place to enjoy the sun and the fresh sea air. Vlieland is one of the Wadden islands and although not as rich with historical buildings there is still enough to see on a lovely walk. After your walk, you can have a delicious dinner in one of the charming restaurants.